For a select number of students every year, the Lumos Travel Award provides the opportunity to travel on a self-guided and designed international work experience. Students have traveled all over the world to countries such as Haiti, Thailand, Nepal and many more. For recent Belmont graduate Madison Barefield, South Africa was the place she wanted to spend her time helping others. 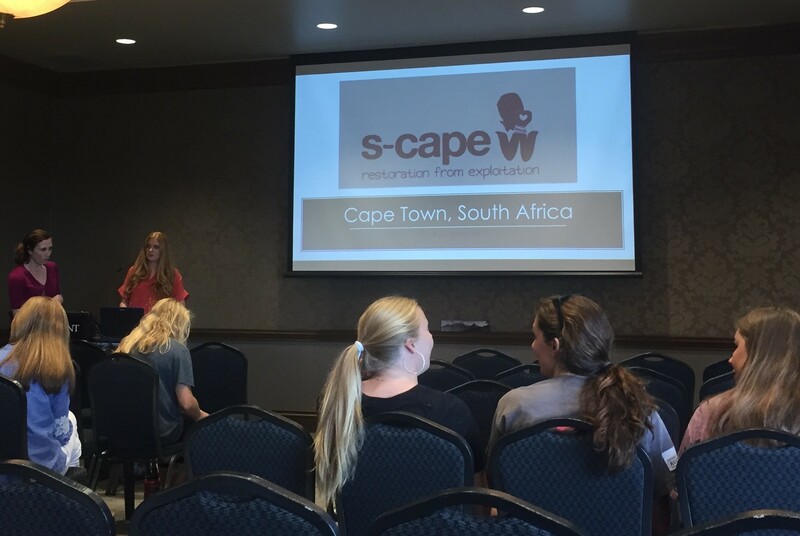 At a recent convocation event on campus, Barefield shared her experiences with S-CAPE in South Africa with students and faculty. After taking the Belmont in Africa Maymester trip, Barefield was compelled to return and make a bigger difference. For her, the best way to do that was the Lumos Award. Every year, Belmont students have the opportunity to design their intended work project and apply for the Lumos Award. If awarded the scholarship, students embark on their eight week or longer intensive and immersive experience. S-CAPE is an organization that provides safe houses for survivors of human trafficking in South Africa. They are the only safe house is the Western Cape and provide different levels of assistance to the women who are under their care. The organization and its team of house mothers, social workers and volunteers focus on rehabilitating women through their programs. Barefield, as a volunteer, wore many different hats and got involved in several aspects of daily function in the organization. From her experiences at Belmont, specifically in her courses in social entrepreneurship, Barefield was able to bring new things to the table at S-CAPE. Outside of her various duties of grocery shopping and administrative work, Barefield was able to write grants and teach different social entrepreneurship development classes to the other workers at S-CAPE. Barefield was also able to take part in outings with the women at S-CAPE and remembers their trip to an equine therapy facility as one of the best. “It was amazing to watch the women transform… and to see them overcome their fear,” she said. Through wearing many different hats in her work in the organization, Barefield got to spend a lot of time with the women and truly see them develop.